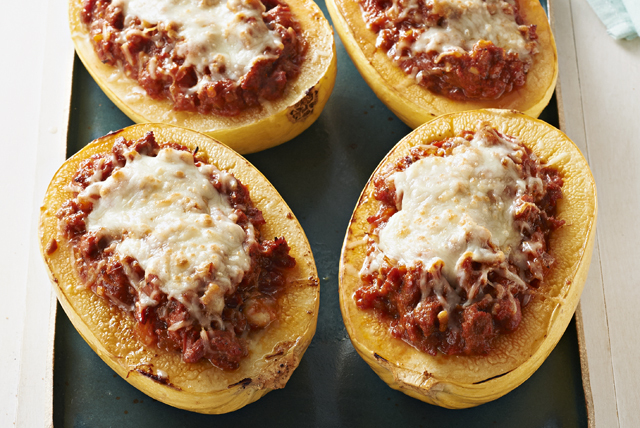 Imagine a cheesy, meaty lasagna stuffed into squash halves instead of layered with noodles. When spaghetti squash is in season, this dish is a must-try! Brush cut sides of squash evenly with oil; place, cut sides down, on baking sheet. Bake 30 min. or until tender. Meanwhile, cook sausage with onions and garlic in large skillet on medium heat 10 min. or until sausage is done, stirring frequently. Stir in pasta sauce; simmer 10 min., stirring occasionally. Remove from heat. Combine ricotta, Parmesan and 1/2 cup Italian Cheese. Place squash halves on baking sheet; fill with layers of ricotta mixture, meat sauce and remaining Italian cheese. Bake 15 to 20 min. or until heated through. Cut in half to serve. Serve with fresh fruit and a quick bagged salad tossed with your favorite KRAFT Lite Dressing.